In Android, CardView is another main element that can represent the information in a card manner with a drop shadow called elevation and corner radius which looks consistent across the platform. CardView was introduced in Material Design in API level 21 (Android 5.0 i.e Lollipop). This new widget is a big step for displaying data/information inside cards. We can easily design good looking UI when we combined CardView with RecyclerView. A CardView is a ViewGroup that can be added in our Activity or Fragment using a layout XML file. The CardView widget is a part of separate library valid for API 7 level or higher. Add the following dependency in your Gradle build file to use CardView. Now let’s we discuss some common attributes of a CardView that helps us to configure it in our layout (xml). This attribute is used to set the Background color for the CardView. We can also set the background color programmatically using setCardBackgroundColor(int color) method. Below we set the black color in the background of CardView.. This attribute is used to set the corner radius for the CardView. We can also set the corner radius programmatically using setRadius(float radius) method. Below we set the black background and corner radius for CardView. This attribute is used to set the elevation for the CardView. Elevation is used to show the shadow of the CardView. We can also set the card elevation value programmatically using setCardElevation(float elevation) method. Below we set the black background and elevation value for the CardView. This attribute is used to set the inner padding between the edges of the Card and children of the CardView. This attribute is used to set the equally padding between all the edges of the card and children of the CardView. We can also set the padding from bottom, top, left and right edges. We can also set padding programmatically using setContentPadding(int left, int top, int right, int bottom) method. Below we set the black background and 20dp value for the inner padding between the edges of the Card and children of the CardView. This attribute is used to set the inner padding between the bottom edge of the card and children of the CardView. Below we set the black background and 20dp value for the inner padding between the bottom edge of the Card and children of the CardView. This attribute is used to set the inner padding between the left edge of the card and children of the CardView. Below we set the black background and 20dp value for the inner padding between the left edge of the Card and children of the CardView. This attribute is used to set the inner padding between the right edge of the card and children of the CardView. Below we set the black background and 20dp value for the inner padding between the right edge of the Card and children of the CardView. This attribute is used to set the inner padding between the top edge of the card and children of the CardView. Below we set the black background and 20dp value for the inner padding between the top edge of the Card and children of the CardView. Let’s we discuss some important methods of CardView that may be called in order to manage the CardView. 1. setCardBackgroundColor(int color) : This method is used to set the background color for the CardView. Below we set the background color for the CardView. 2. setCardElevation(float): This method is used to set the backward compatible elevation of the CardView. This method sets the value in float type format. Below we set the backward compatible elevation value of the CardView. 3. getCardElevation() : This method is used to get the elevation value which we set using setCardElevation(float) method. This method return a float type value. Below we firstly set the elevation value and then get the same of CardView. 4. setRadius(float radius) : This method is used to set the corner radius value of the CardView. This method sets the value in float type format. Below we set the corner radius value of CardView. 5. getRadius() : This method is used to get the corner radius value that we set using setRadius(float radius) method. This method return a float type value. Below we firstly set the corner radius value and then get the same of CardView. Below we set the value of padding between the card’s edges and the children of the CardView. 7. getContentPaddingBottom() : This method is used to get the inner padding before the Card’s bottom edge. This method returns an int type value. Below we firstly set the content padding and then get the inner padding before the Card’s bottom edge. int bottomPadding = cardView.getPaddingBottom(); // get the inner padding before the Card's bottom edge. 8. getContentPaddingLeft() : This method is used to get the inner padding after the Card’s left edge. This method returns an int type value. Below we firstly set the content padding and then get the inner padding after the Card’s left edge. int leftPadding = cardView.getPaddingLeft(); // get the inner padding after the Card's left edge. 9. getContentPaddingRight() : This method is used to get the inner padding before the Card’s right edge. This method returns an int type value. Below we firstly set the content padding and then get the inner padding before the Card’s right edge. int rightPadding = cardView.getPaddingLeft(); // get the inner padding before the Card's right edge. 10. getContentPaddingTop() : This method is used to get the inner padding after the Card’s top edge. This method returns an int type value. Below we firstly set the content padding and then get the inner padding after the Card’s top edge. int topPadding = cardView.getPaddingLeft(); // get the inner padding after the Card's top edge. Below is the example of RecyclerView As GridView in which we display list of Person Names with their images with default vertical orientation by using RecyclerView. In this example we are using LinearLayoutManager with default vertical orientation to display the items. Firstly we declare a RecyclerView in our XML file and then get the reference of it in our Activity. After that we creates two ArrayList‘s for Person Names and Images. After that we set a LinearLayoutManager and finally we set the Adapter to show the list items in RecyclerView. Whenever a user clicks on an item the full size image will be displayed on the next screen. Step 1: Create a New Project And Name It RecyclerViewExample. Step 2: Open Gradle Scripts > build.gradle (Module: app) and add RecyclerView & CardView Library dependency in it. In this step we create a RecyclerView in our XML file. Step 4: Create a new XML file rowlayout.xml for list item of RecyclerView and paste the following code in it. In this step we create a new xml file for item row in which we creates a TextView and ImageView to show the data in grid format. In this we define the views inside CardView to display the items in the form of cards. Step 5 : Now open app -> java -> package -> MainActivity.java and add the below code. In this step firstly we get the reference of RecyclerView. After that we creates two ArrayList‘s for Person Names and Images. After that we set a LinearLayoutManager and finally we set the Adapter to show the list items in RecyclerView. Step 6: Create a new class CustomAdapter.java inside package and add the following code. In this step we create a CustomAdapter class and extends RecyclerView.Adapter class with Viewholder in it. After that we implement the overrided methods and create a constructor for getting the data from Activity. In this custom Adapter two methods are important: First is onCreateViewHolder in which we inflate the layout item xml and pass it to View Holder and other is onBindViewHolder in which we set the data in the view’s with the help of ViewHolder. Finally we implement the setOnClickListener event on itemview and on click of item we display the selected image in full size in the next Activity. // implement setOnClickListener event on item view. Step 7: Create a new XML file activity_second.xml and add below code in it. In this step we create a ImageView in our XML file to show the selected image in full size. Step 8: Create a new Activity and name it SecondActivity.class and add the below code in it. In this step we get the reference of ImageView and then get Intent which was set from adapter of Previous Activity and then finally we set the image in ImageView. Now run the App and you can see person names with their images with default vertical orientation in Card style. Click on any image and it will open in large size. Below is the example of CardView in which we display the data/information in a Card. In this example we use ImageView and TextView inside a card. Whenever a user click on the card a message “CardView clicked event ” is displayed on the screen with the help of Toast. Step 1: Create a new project and name it CardViewExample. Step 2: Open Gradle Scripts > build.gradle and add CardView Library dependency in it. In this step we create a ImageView and a TextView inside our CardView. We also use elevation, background and other attributes of CardView. Step 4 : Now open app -> java -> package -> MainActivity.java and add the below code. In this step firstly we get the reference of CardView and then set the corner radius value.Finally we implement the onClickListener event on CardView so that if a user clicks on CardView a message “CardView clicked event” is displayd on the screen by using a Toast. Now run the App and you will see simple CardView which will display the information. This free eBook will help you master the learning of Android Material Design in Android Studio! 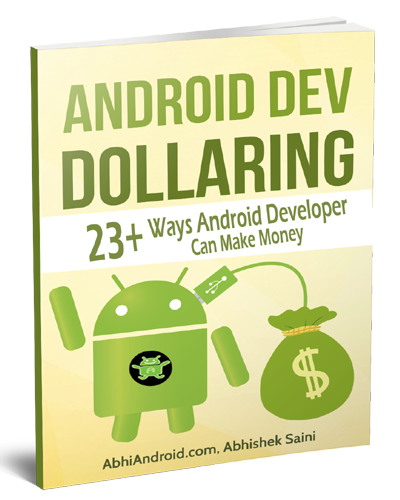 Join over 5056 Android developers in our community and get access to this free eBook now! Struggling with Android Material Design? Download this FREE eBook and master learning of Android Material Design!